For the classic dish done right, this 65-year-old favorite serves it with a grilled hamburger patty piled over white rice and smothered with warm gravy and fried, runny eggs. It comes in two different sizes for the hungry and extra hungry. Added bonus: a side of their infamous butter roll is included with your meal -- perfect for sopping up stray gravy that somehow didn’t already make its way to your mouth. In addition to satisfying your pipikaula and lau lau needs, this 68-year-old local institution’s Kaka'ako location offers a mélange of loco moco creations on a secret menu. That said, the on-menu Smokin' Moco, a smoky meat option, is a crowd favorite, omitting the traditional beef patty for slightly sweet kiawe-smoked meat covered with sautéed onions and peppers, a special aioli sauce, and two runny eggs over rice. Order with a side of squid luau, and you can have your traditional Hawaiian and local food... and eat it, too. 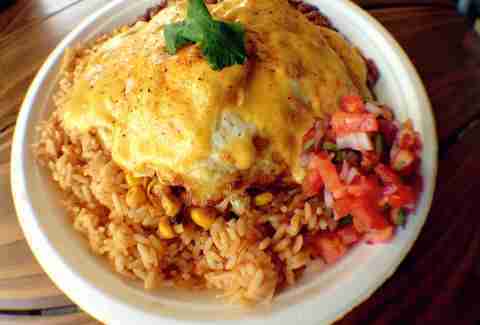 The local classic gets a south-of-the-border makeover in the form of the Mexican loco moco, served with marinated al pastor, Spanish rice, served with pinto beans and two eggs over easy. The extra kick? Melted, golden queso drizzled liberally over the top. LeeAnn Wong’s take on the dish comes on a hot cast-iron skillet, which means patient diners can enjoy their garlic rice crispy, with a medium rare Maui Cattle Company beef patty. The Koko Moco is then topped with mushroom gravy, a sunny side-up egg, and tempura kimchi, the meal is a tasty variation of the customary loco moco. 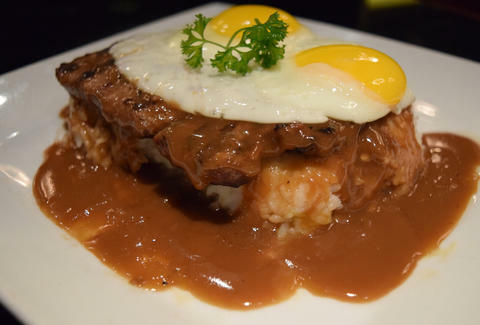 For a dressed-up take on the standard dish, make your meal extra fancy with the prime rib loco moco, which features 8oz of soft and juicy beef, coated with extra-dark mushroom and onion gravy. Although Drew Barrymore and Adam Sandler frequented a restaurant of the same name in 50 First Dates, the movie’s incarnation was, sadly, just a movie set. But this real life, seemingly innocuous restaurant on the island’s northeastern shore has received acclaim for its tasty take on the island staple. The massive meal comes on a plastic plate and is filled to the brim, with their two hamburger patties and mushroom gravy stealing the show. Tender, braised short ribs play substitute in Eric and Nicole Chang’s take on the island classic. 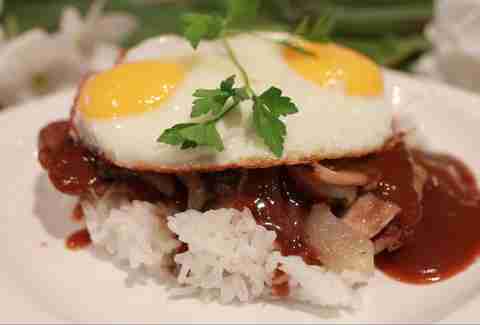 The sizable stack of ribs and eggs crown a bed of fluffy rice drenched in thick, rich gravy. With ribs so well seasoned, you’ll barely miss the customary beef patty. Pro tip: order the fried rice upgrade for optimal enjoyment. Next door to the nation’s only daily tuna fish auction, this waterside eatery is understandably known for their fresh catch. But... just once, forgo the furikake ahi and seafood specials for their fall-off-the-plastic-fork charred patty, topped with a generous scoop of mushroom and onion demi-glace gravy, served with a side of macaroni salad and chow mein. Ignore your friends’ jeers for not ordering the fresh fish, and maybe, if they’re lucky, you’ll let them have a bite before you clean the plate. As one of the creators of Hawaiian regional cuisine, Alan Wong turns the classic comfort food into a gourmet dish. 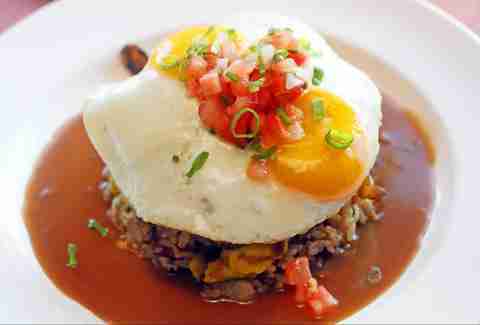 Made with Kuahiwi Ranch beef, the plate comes with two island eggs topped with a small scoop of lomi salmon, and served with kalua pig fried rice in a shallow pool of veal jus. Ringing in at $21, their version is one the most expensive offerings on this list, but we think it’s worth every penny. Served all day long, this windward-side diner’s regular size Moco, the Loco Aina Special, comes with thick beef patties, three fried eggs, gravy and a mountain of rice, with portions that nearly overflow the plate. Less hearty eaters can opt for the “mini” portion, which is still big enough to stuff you silly. Okay, so this restaurant isn’t in Oahu, but it’s hard to talk loco mocos without including one of the godfathers of the local comfort food. Many claim to have invented the dish, but local lore says either Lincoln Grill or Cafe 100 created the starchy meal in 1949. 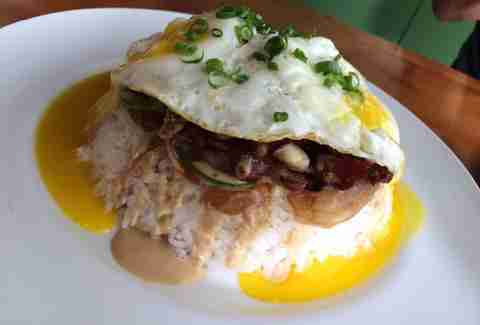 While the former has since gone to diner heaven, the latter still serves its trademarked loco moco, with chicken, fish, vegetables, or sausages, in addition to the classic hamburger patty. In addition to all that, C100 also offers a Super Loco that includes Portuguese sausage, Spam, and beef, topped with the requisite brown gravy and your choice style of eggs. With a side of mac salad! For less than $8! Summer Nakaishi is a freelance writer for Thrillist and thinks the best part of a loco moco is a perfectly fried egg -- crispy on the outside, but runny on the inside.